There is a wonderful slice of fishing heaven just off the beaten path in Columbia County called Long Lake. It’s just a few miles off Highway 33 outside Portage, Wisconsin, and connects with the Baraboo River. In my adult life I have lived in the city of Portage twice – once just out of high school and the second time from 1999-2004. At the end of the second go-round I thought I discovered a new lake for Dad and me to fish in, but it turned out he had already been there several years before. We had been talking about renewing my childhood love of pan fishing for some time and I started to scout for lakes in the area for us to try out. 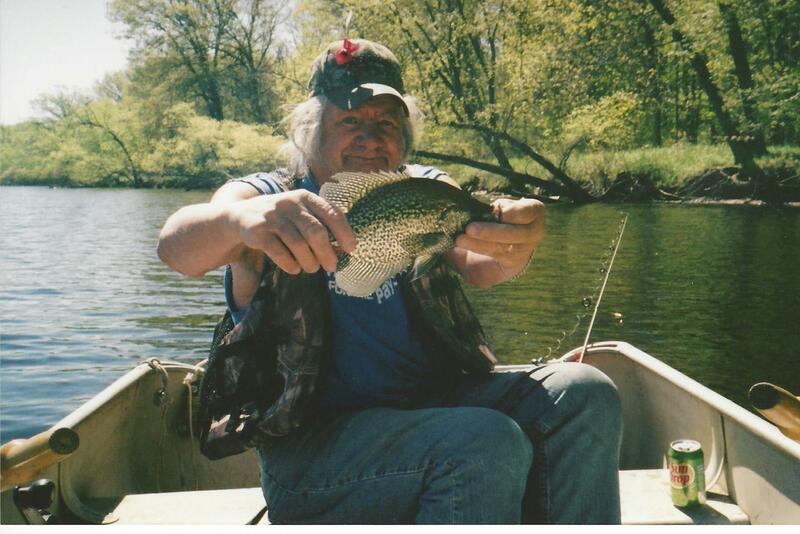 An obvious choice was Silver Lake in Portage, but I had tried there years before and only caught small bluegills. A second attempt turned up the same results, so I looked for lakes outside the city. Long Lake caught my eye as the online reports were good – at least the handful that I found, anyway. I took that to mean it wasn’t fished to death like some other lakes. I sold my Portage house in late 2004. The realtor that originally helped me find it also listed and sold it too. After the closing I told her I loved the area and if she came across any waterfront property (preferably with a cottage) to let me know. I was thinking maybe I could find something cheap enough to have for weekend fishing and writing visits – just something simple where I could clear my head a bit. The realtor said she’d let me know, but admitted properties on Long Lake were not desirable due to flooding in the spring and droves of mosquitos. Real life quickly took over and I forgot all about the conversation. Right before Memorial Day the following spring I got an unexpected call at work from the realtor. She had a line on a property with a not quite finished cottage that just needed paint and flooring. The seller was looking to get out fairly cheap, which still would be a profit on what he purchased it for 30 years prior. The location was on the Wisconsin River just a few miles to the west of Portage. Was I interested? Heck yeah! After a summer of wrangling the cottage was mine. Dad and I spent the latter part of the summer and fall putting in floor tiles and painting the walls in the 24×24 getaway on stilts. I should correct that. I did the painting. Dad couldn’t stand painting. He did put in a nice deck off the front of the cottage that faced the river. Until then we called it the door to nowhere. 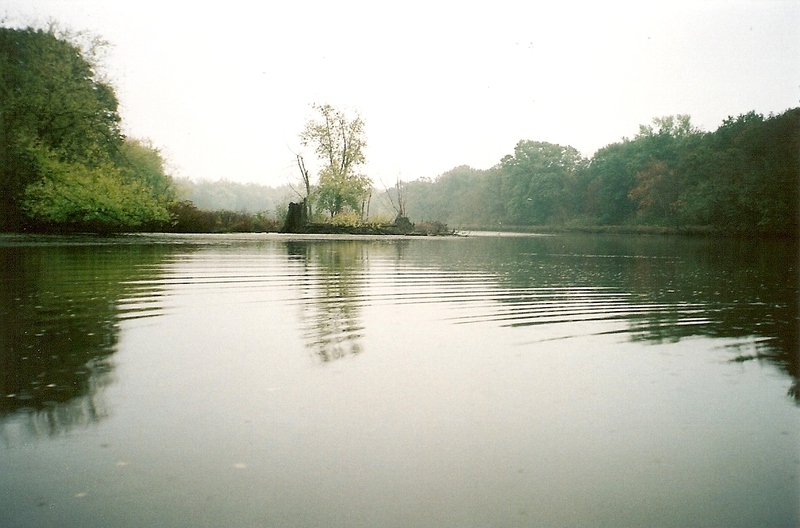 In the spring of 2006 we started fishing the area, first with the aforementioned Silver Lake. That was good for one outing as we quickly discovered the fish size was horrible. We quickly moved on to Long Lake. The guy who sold me the cottage left a 14 foot alumacraft boat, circa 1970. Dad found a boat trailer and also offered up his old boat motor, the one we used in Canada back when I was a kid. You don’t need anything special to fish on Long Lake, and I guess what we had fit the bill perfectly! Needless to say, Dad got into Harlan’s boat every time and left grandpa and Ronnie in the other boat. Dad said he and Harlan caught fish like crazy there and he learned a lot from his uncle. The learning part I believed, but the fishing – well, you never knew with Dad. He was just as good as any old fisherman when it came to telling fish stories! But he was right. While the exterior of the lake had changed in the 50+ years since he had been there, the fishing hadn’t. One side of the lake had cottages and trailers – and that was where the boat launch was located. The opposite side of “civilization” was mostly wooded and turned out to be where we caught the most fish. Dad said when he was young a lot of the wooded land was owned by a farmer that let them cross his property to access the lake. As for the name of the lake, Dad said he figured some old settler stumbled upon it years ago and could find the beginning or end of the lake. “He probably said, ‘Hey – now that’s one Long Lake’ and the name stuck,” Dad said. The lake was a fisherman’s dream. We caught mainly bluegills and crappies – and some of the biggest we’d ever seen. That’s no fish tale my friends. We saw an occasional fisherman going along the shores for bass, but we kept to what we were doing. Some days we didn’t catch anything and then we’d try for northerns. Dad caught one accidentally on a day we were crappie fishing, but not having any luck. We figured the big guy scared all of our fish away and then attacked Dad’s worm! Dad also accidentally caught a turtle. Well, almost. He had it up near the boat and got its head out of the water, then the giant snapped the line. I tried but failed to get a photo. One great photo I did get (below this story) was Dad just taking a fish off the hook. Later after I got it developed I noticed an ad on Walgreens where you could take a photo and make a fake magazine cover out of it. So used that photo and created Dad on the cover of Fisherman Monthly or something like that. He put it up in his shed and would get an occasional guest asking how he got on the cover of such a prestigious magazine! Caught about 25 keepers in the “sweet spot” between the two downed trees today on both minnows and worms. The real odd thing was Dad caught only crappies and I caught only bluegills. I sold the cottage after a few years when it got harder to get up there in the summer. Dad and I discovered a campground with rental cabins a few miles down the road called Ski High. Occasionally we’d rent a cabin for the weekend and go fishing at Long Lake. 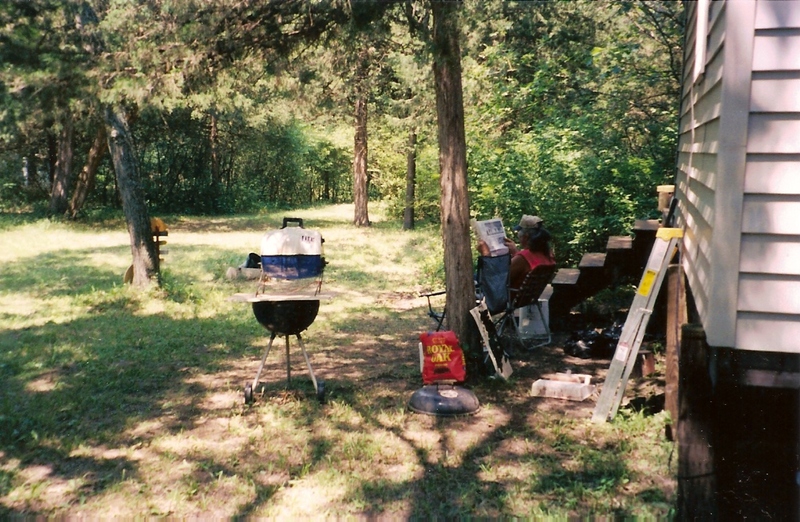 It naturally wasn’t the same as my cottage, but we still could grill out and listen to a ballgame after fishing. Eventually we stopped going altogether. Dad started to have difficulty getting in and out of the boat. Sitting for a long time on a metal seat was also a problem, even with a cushion. Without a doubt I would give anything to have even an hour out on Long Lake with Dad again. So in place of that, I figuratively raise a can of Dad’s favorite cheap beer (Hamms) in his memory, and in remembrance of great times on the water. Dad often said we were in “the land of sky blue waters” when we fished Long Lake. It was more than just the Hamms slogan – he was right. Thanks Dad for tons of great memories. Dad reading to the paper while listening to a ballgame. I’m sure the grill was fired up too! Dad always told me to zoom in when I took the photos so the fish looked even bigger! 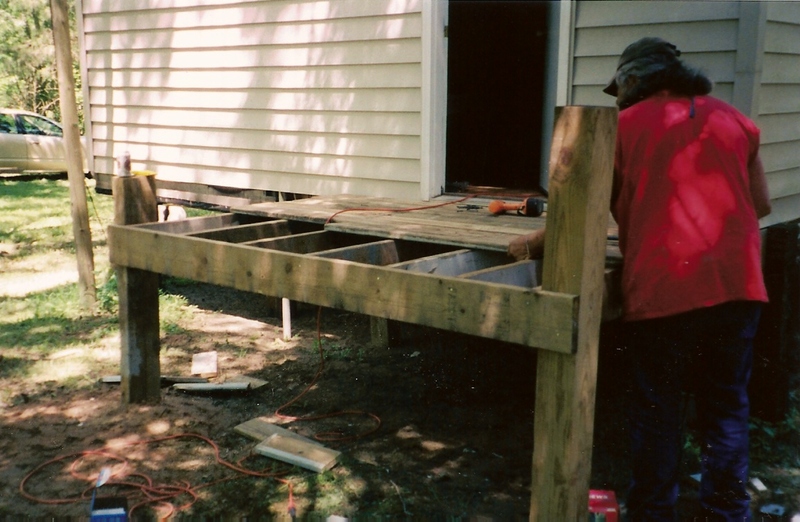 Dad building a deck. Where’s his Hamms?